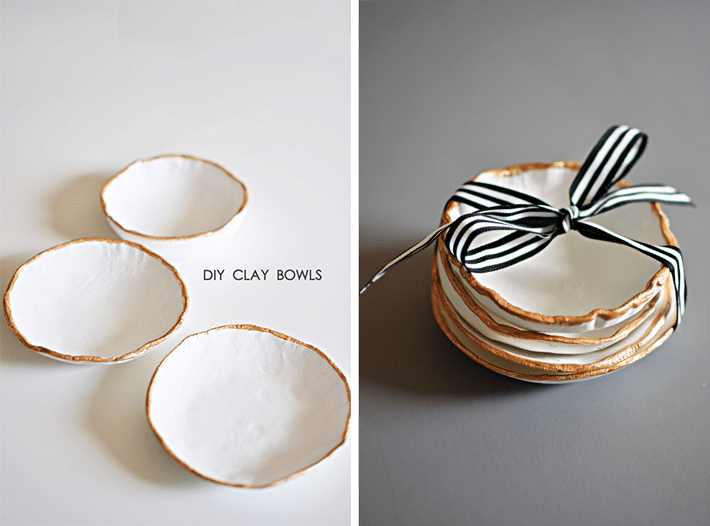 We love air dry clay because it is so simple and fun for kids and adults to use. 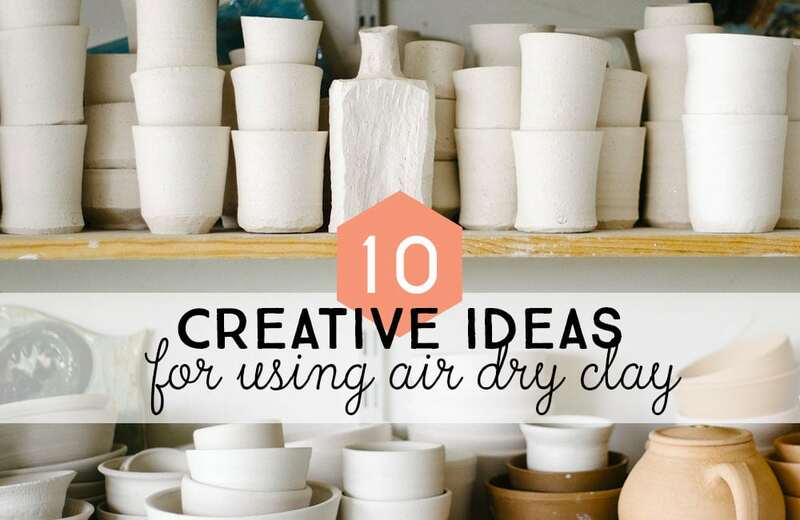 This amazing list of things to make with air dry clay will get you going. You’ll find tutorials and air dry clay tips. Today we sing the praises of the wonderfully useful Air-Dry Clay and we’re here to give you some ideas of things to make with air dry clay. Why do we love it? For one thing, we don’t need a kiln to use it. Air-dry clay is easy to work with, it dries without the use of a kiln or oven, and can be made into many beautiful objects. There are several different kinds of air-dry clay. Many of the projects below use either Crayola Model Magic or DAS Air Hardening Modeling Clay. Another option is Activa Plus Natural Self-Hardening Clay – Use this for projects that require a natural clay and those that need to be porous for essential oils. 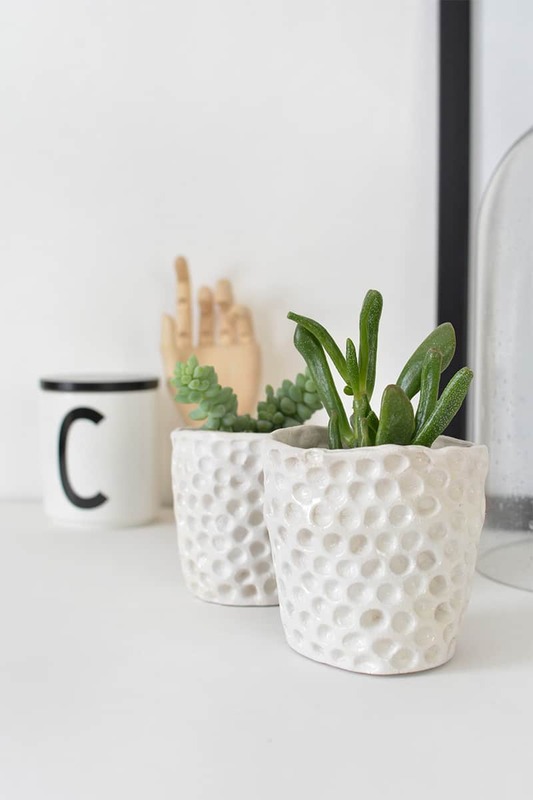 The added texture on these planters from burkatron turns an ordinary pot into something much for interesting and tactile. 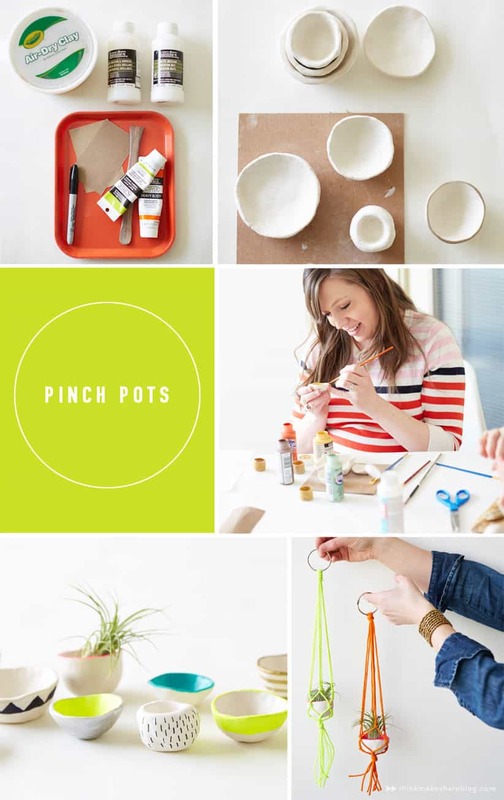 Classic pinch pots take on a fresh look with the simple addition of paint. Try color blocking and adding geometric patterns for modern style. Think Make Share Blog shares their results. 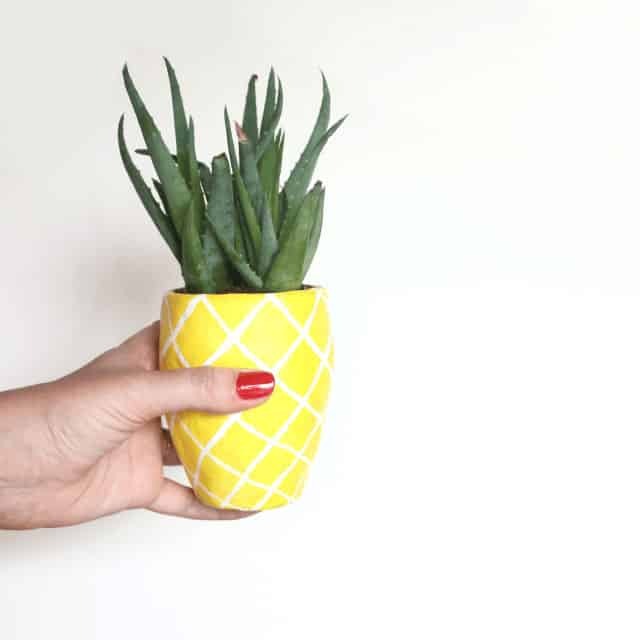 If you need some pineapple decor in your life, check out this awesomely creative succulent planter from Lines Across . I love the simpleness of the gold trim on the soft white form of these air dry clay bowls from S.C. Johnson (via Little Inspiration). These would make great gifts or to keep as trinket holders. Natural clay is porous enough to be an effective diffuser for essential oils. Use your favorite essential oil with this pendant tutorial from Mommypotamus. 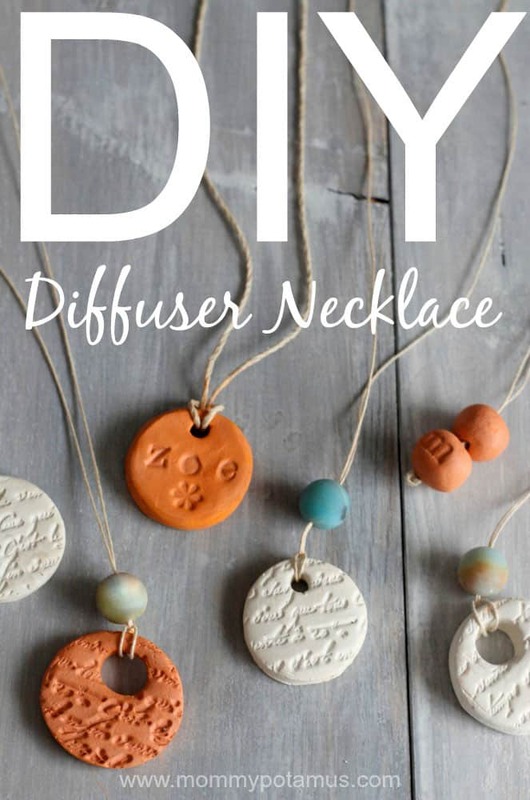 Like the idea of a clay essential oil diffuser, but not into the look of a clay necklace? 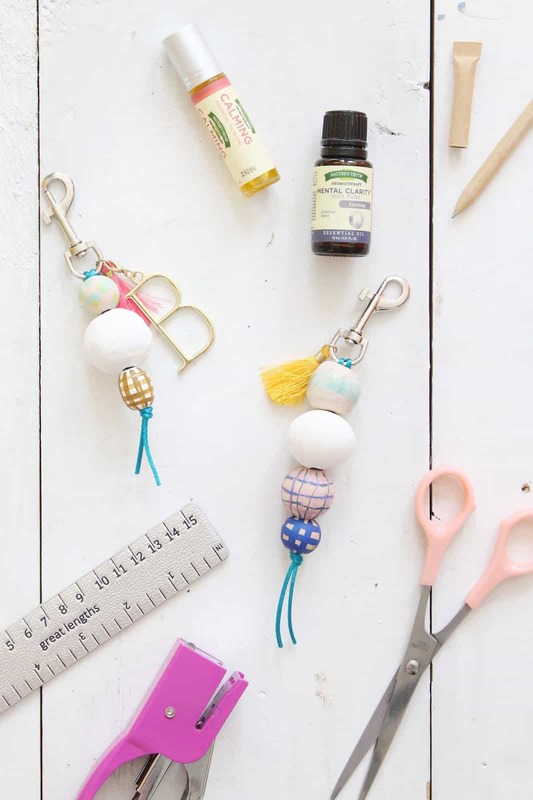 Check out these diffuser keychains from Lindsay Crafter. They’re seriously cute on their own, but when you add the benefits of essential oils, they’re a sure win. 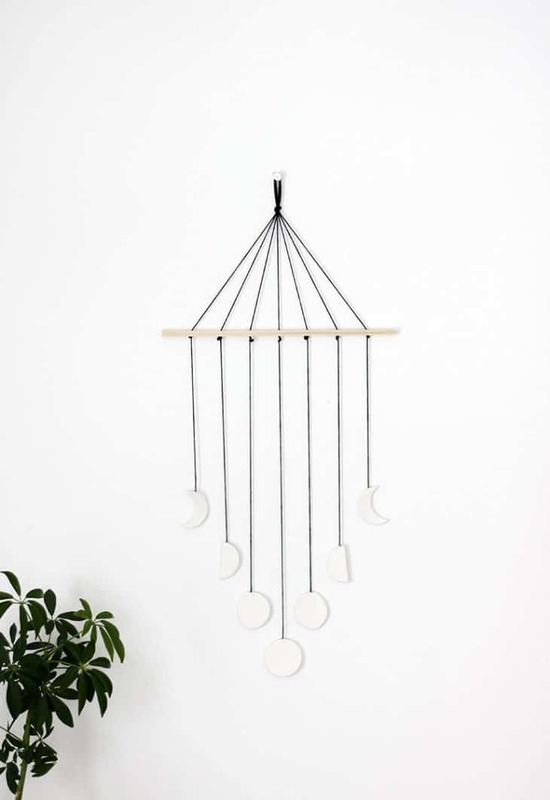 I love this Moon Phase Wall Mobile for a nursery. The simple white clay looks very soothing and natural, and the moon phases have a sort of symbolism to them I think. Project from The Merry Thought. Monstera leaves have such beautiful and interesting forms, it’s no wonder they’re so popular right now. 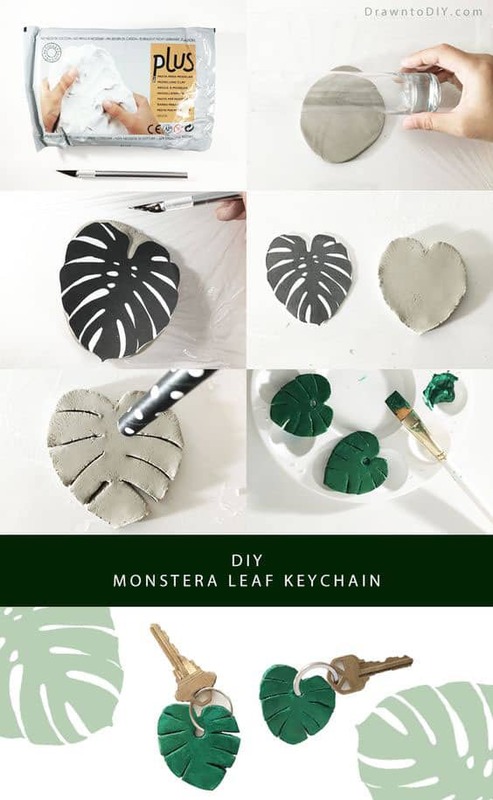 You can bring a little bit of that style with you on the go with these DIY monstera leaf shaped keychains from Drawn to DIY . 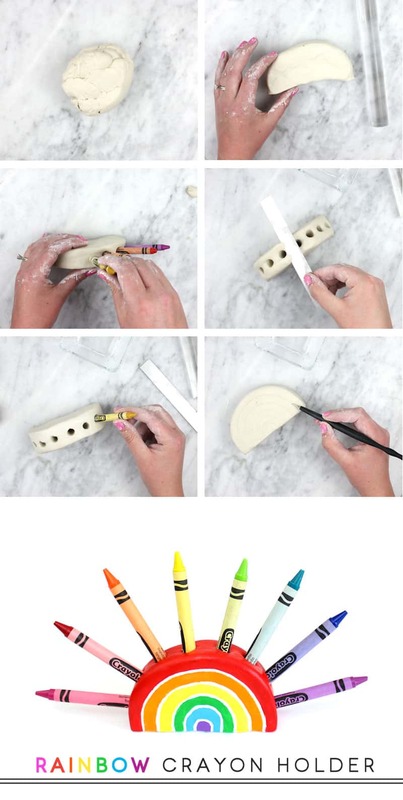 Add some color to your kid’s art station with this fun air dry clay project from Lines Across. 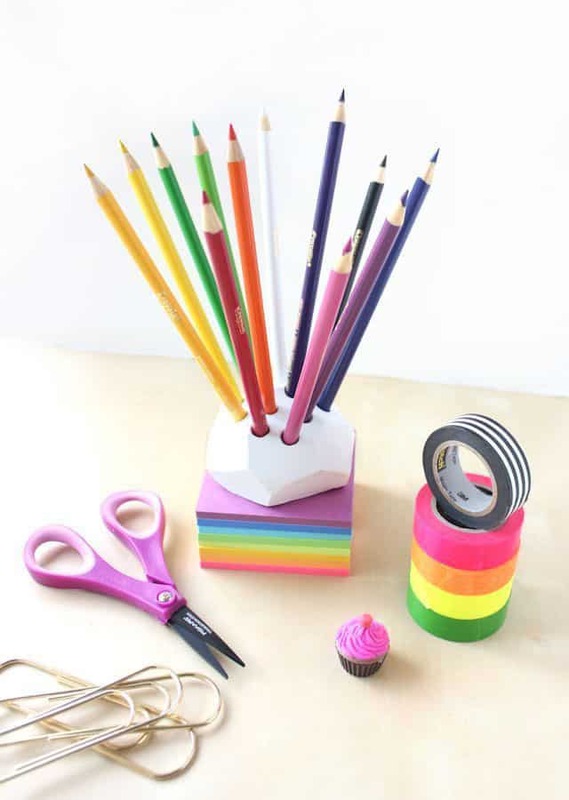 You can make this fun pencil holder from Lines Across. The geometric shape adds a modern touch, and I think it would be right at home on a crafting table or desk! Which Air-Dry Clay is the best? Deciding on which air-dry clay to buy, there are a few things you should keep in mind. Do you need a natural or paper-based clay? Are you using if for kids crafts or are you hoping to make pieces that are somewhat more substantial? The Artful Parent has some very useful reviews based on her experiences with the different types of clay. Also, it’s your best bet to follow the guidelines of the tutorial you are using. In the end, much of this comes down to personal preference and how you will use your clay. So, try a few things and play around so that you can find the best air dry clay for your personal needs. Want to save this post to come back to for later? Pin this image to save on Pinterest!